Have you noticed the large orange recycling carts at several Schnitzelburg area businesses recently? Many businesses in the Schnitzelburg area receive curbside trash pick-up, but the small orange bins for recycling aren’t always practical for their recycling needs. There is now a solution! 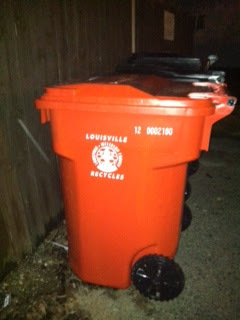 In October of last year, the Expanded Recycling Program was introduced to Louisville’s Urban Services District with 95-gallon recycling carts (the same size as the trash carts) for $50 each. The SACC is supportive of this effort in our neighborhood, and decided that this idea needed a push to get this started in Schnitzelburg! As a benefit to our member businesses, SACC partnered with Councilman Jim King to provide one recycling cart per business at no charge to encourage them to try recycling and see how easy it is to do. The collection process is based on a single stream system--recyclables don’t have to be separated-- they can all go into one container, which will be picked up weekly. This program has been highly successful with many businesses and residents increasing their recycling capacity with large carts. Several Schnitzelburg businesses seized the opportunity, and the carts were recently delivered. We are hoping that more businesses will see these carts and jump on the bandwagon, so encourage the businesses you patronize to recycle! Hopefully businesses will find that they need more than one cart and will replace their black trash carts with the orange recycling carts. Making this switch is a great way for the businesses in Schnitzelburg to show residents how much they care for our community, and how we can all show our commitment to having a greener community and that we should all recycle! Are you a Schnitzelburg Business or Resident interested in a 95-gallon recycling cart? Let SACC know by sending us an email: sacc@insightbb.com !